Are you in need of inspiration to write? Are you looking for a poetry prompt or meme to write for? Whatever your reasons Poets United wants to help you find your muse. We are all about poets and the poetry community so we have compiled a list of active prompt sites to make it easier for you to find inspiration. All sites are hyperlinked and will take you directly to the main page of the prompt site you select by opening it in a new window. There are sites for every day, style and occasion. You can find steamy and hot prose all the way to Haiku and Flash Fiction. If you want a phrase, photo, song or movie there is a site/prompt out there just waiting for you! This is the cure for any writer’s block so please explore all you want. 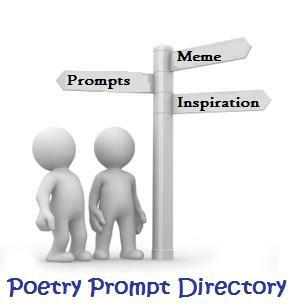 Note: The pages and prompts listed below are only for prompt sites which inspire poems and short stories. At this time we are not listing any other type meme or prompt (i.e. questionnaire style). Poets & Writers (Writing Prompts) Each monday a workshoop quality prompt is put up. Participate to get better here. Poetry Train - Get on board and post any Poetry you like all week. Monday's Child - Each week a classic children's illustration is posted to inspire poems, stories and fairy tales. Big Tent Poetry - A prompt is offered each monday then come back and post it Friday's. Stony River (Microfiction Monday) - 140 letters or characters is all you get to write for this prompt. You can post all week. Bifocal Univision (Monday Photo Prompt) - A photo is snapped by Eric, use it as you see fit. You can post your inspired writings all week. Inside My Poem Book (Experimenting with Poetry Forms) - Each week a new style and form is introduced for poets to write in. If you are willing to learn and try new styles this is a good place. Mad Kane's Humor Blog (Limerick-Off) - Each week Mad Kane hosts a Limerick-Off in which she posts a limerick and invites poets to write their own limericks using the same first line. Magpie Tales - A unique photo prompt is posted every Monday. Carry on Tuesday - A song, verse or famous phrase inspires your pen here. You can post all week. Tuesday Tryouts - A worskshop style prompt to hone your writing skills is what you will find here. 3 Word Wednesday - You get three words here to inspire your pen. Use them all! One Stop Poetry (One Shot Wednesday) - Every Wednesday you get the chance to share whatever you wish. Posts and links are accepted all week. ABC Wednesday - A fun project, now in its fourth year! Each wednesday a letter of the alphabet is offered as the prompt. If you have something to share, be it a photograph, piece of art or poetry post in on your blog and link it on their page. Poets United (The Thursday Think Tank) - A picture and some inspiring words are what you get here. You can post responses all week. We Write Poems - Each week, wonderful and involved prompts are put up for all to take part in. You have all week to post your responses. Thursday Tales - A photo prompt is put up each week. You have all week to submit. Theme Thursday - A phrase and a photo inspire your writings when visiting here. You have all week to post. G-Mans Friday Flash 55 - Here you get 55 words. No More, No Less. The Gman posts a photo or two as a prompt and you write the story or poem. Its a pretty fun challenge. Magic in the Backyard (Free Write Friday) - A thoughtful and inspiring prompt is put up each Friday by Kellie Elmore. The object is to write without boundaries. Your challenge is to be uncut and raw, a ranting prose or poem of sorts. You can go back later and perfect your words but for this prompt share your original and gritty creativity. Writer’s Island - 5 years and counting. A word, photo or movie helps to get your creative urges going here. You can post all week. Sepia Saturday - Every week a new classic photo is put on display to inspire your pen. Its well worth the visit. You can post all week. Dishwater Dreams (Just Write Workshop) - A workshop style prompt designed to help improve your writing skills. Sunday Scribblings - One word for the entire week. See what the selected word inspires you to write. Jingle Poetry (Poetry Potluck) - Post whatever you wish starting Sunday at 8pm up till Wednesday at 8pm. One Single Impression - Mainly one word to inspire you to write, sometimes a poem. You have all week to submit your response. Poets United (The Poetry Pantry) - A free for all. If you have a forgotten or second chance poem post it here. Dust off the cobwebs or get people to take another look. Post links all week long here. Haiku Heights - A theme and some inspiration. You have all week to write the perfect 5-7-5. I Saw Sunday - In words or photos you share what you noticed that previous week. Poetry is very welcome. :-) Join in and help to make this an interesting, amusing and inspiring place to visit each Sunday! Post on Sunday if possible but the Linky will remain open all week. One Stop Poetry (One Shoot Sunday) - Each Sunday you get the chance to meet a shutterbug. Someone thats awesome behind the camera. after learning a bit about their style and life you then are presented with an amazing photo to inspire your creativity,share writing on their linky and be sure to check the others. We hope this is a useful tool for all of our members and visitors. If you know of any other active sites that host regular prompts, please feel free to email us their information so we can add them to this list. We will try to update this as often as possible to keep you writing.